Click Event Website link above for more details. Click this link for our Facebook Event page. Click to view our Facebook Event page! Click to view full premium list. 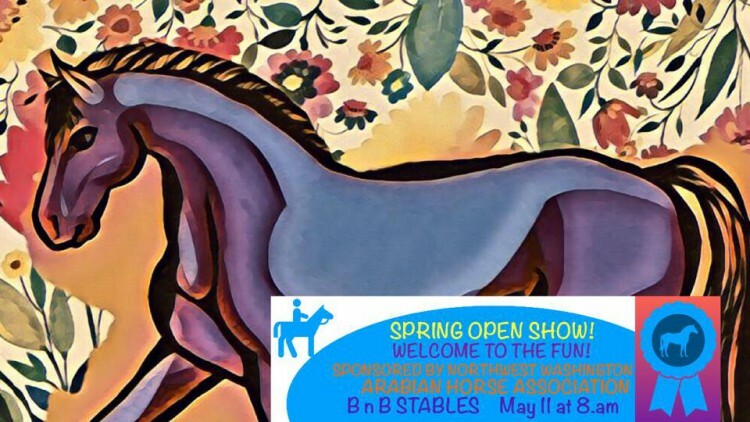 Get ready for the show season and join us at our FUN spring show! Registration 8 a.m., Show begins at 9 a.m.
Pre-register by May 3 and pay the day of show. 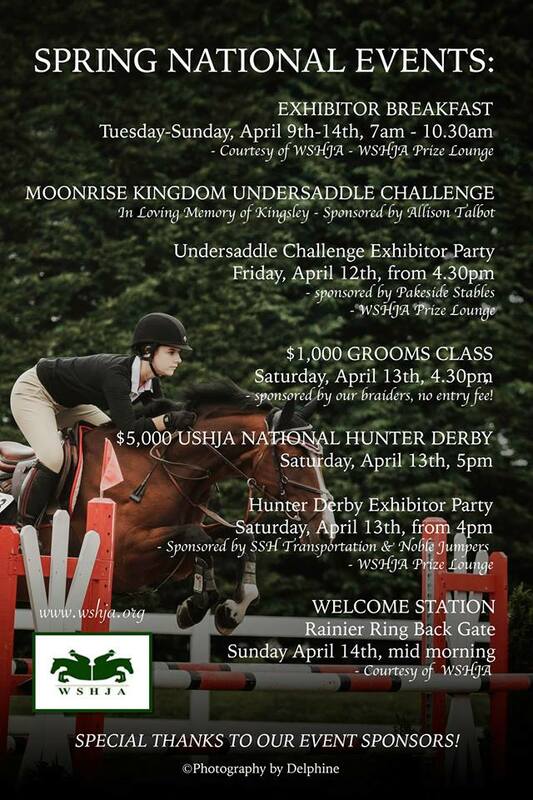 Seasoned and green horses and riders welcome. Check the rules for more information. We have classes for all ages with a new 50 and over high point award. Some of the classes included are Lead line class, Walk-trot, English, Western, Equitation, Halter, Hunter hack and lots more!! The cost if $60 for all day or $9.00 per class. Preregistration and save $5 on the all day fee. IMPORTANT, PLEASE sign up for classes ahead of time to get the discount and make the show organizers job a little easier. Pay the day of the show. We look forward to meeting you and your horse!!! 5 minute break for setup–limited practice! * Horse must be wearing Halter and lead * as well as bridle. 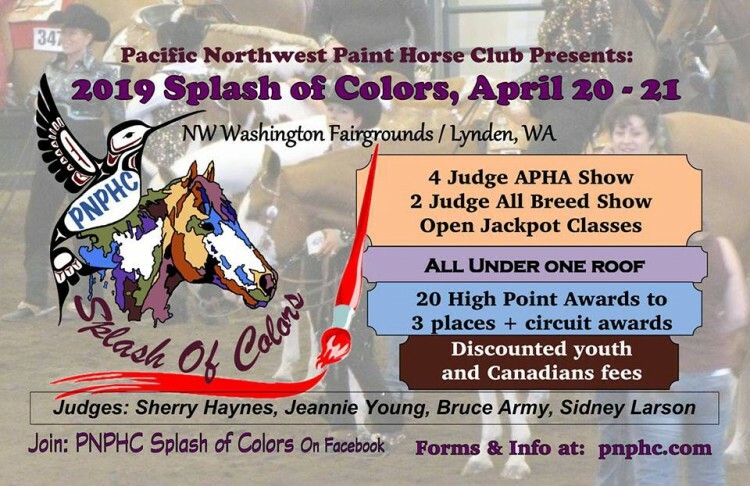 Spring Open Show Northwest Washington Arabian Horse Assn. Note: No novice riders in green horse classes. 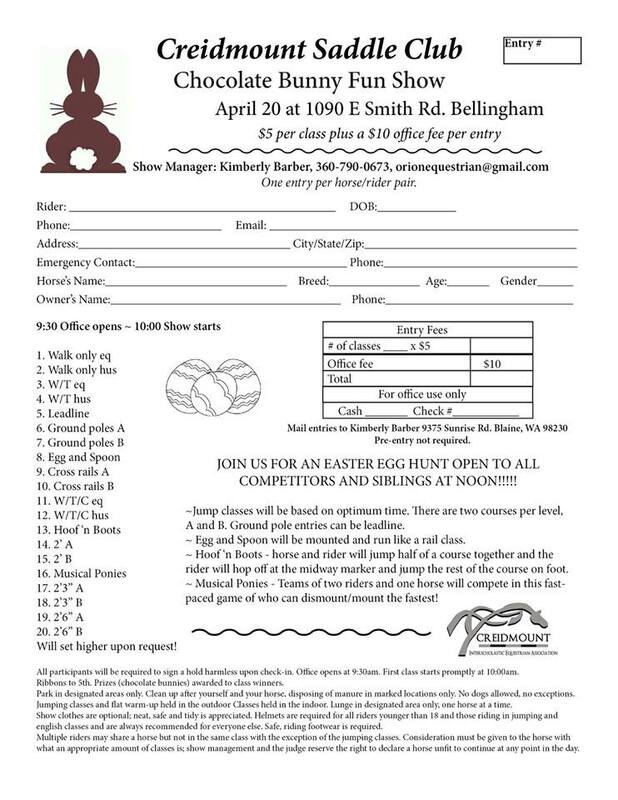 All breeds & ages welcome. Humane training aids* are allowed in all classes. Walk/Trot classes plus all age divisions offered. Various age groups & breed High Point Awards. Ribbons from 1st to 5th place. 1. Training Equipment by discretion of the judge. 2. Decisions of the judge are final. 6. Classes will be split or combined at the judge’s discretion. 7. If schooling only, keep away from the rail during classes and do not interfere with other riders. 8. Age of riders is as of January 1st of current year. 9. Green horses are horses in their first or second year of showing. 10. No novice riders in green horse classes. 11. Lead line horses must have halter and lead as well as bridle. 12. Each horse requires a separate number. 13. Clean up the area around your trailer before you leave. 14. NO DOGS ALLOWED except service dogs. High Point 13 & Under – all classes with 13 & under in the description. Participants must do Showmanship in order to qualify for High Point. High Point 14-17 – all classes with 14 – 17 in the description. Participants must do Showmanship in order to qualify for High Point. 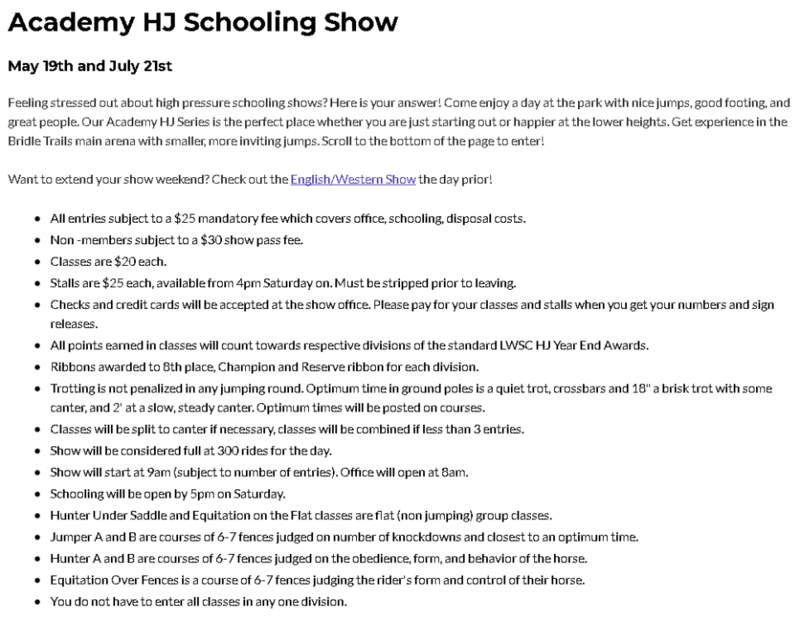 High Point 18 & over – all classes with 18 & over in the description. Participants must do Showmanship in order to qualify for High Point. 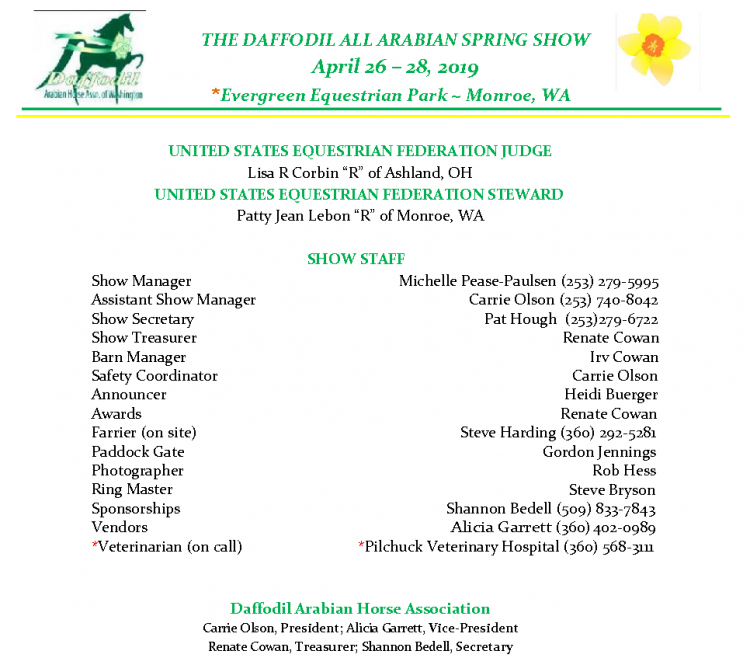 High Point Arabian/Half Arabian – all classes the horse is entered in with any rider will be counted. High Point Other Breed – all classes in which the horse is entered with any rider will be counted. 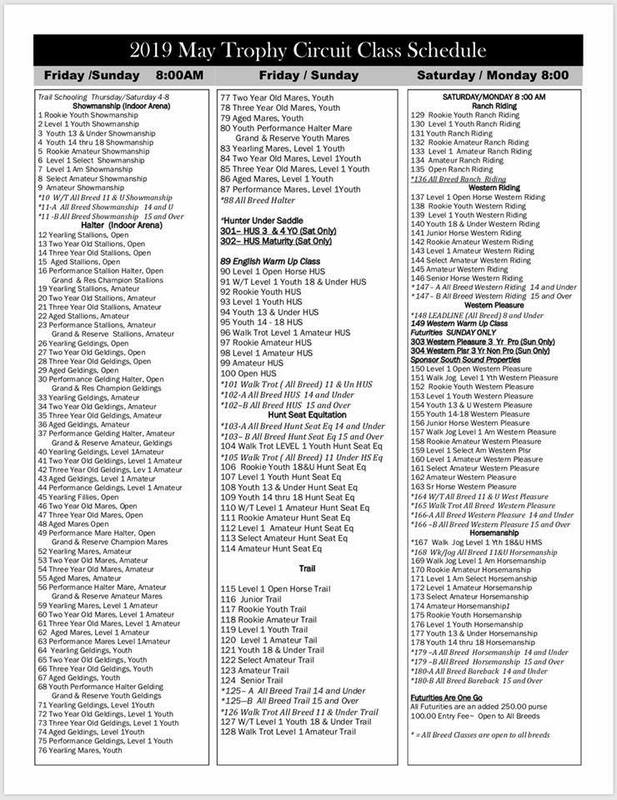 High Point Walk/Trot (Any Breed) – all classes with Walk/Trot in the description. High Point Novice- all classes with Novice in the description. High Point Senior- 50 & over. Must enter all classes for High Point in 18 & over description. Click for Class List, Entry Form, and more! Click to view our Facebook page. This schooling show provides flat classes for English, Saddle Seat and Western disciplines. This is your opportunity to apply all those hours of lessons to the show ring in a relaxed and supportive environment. Are you just starting to show? Have you thought about it but have been intimidated? Then this show is for you! Take a look at the Class List and Register Today. Ribbons awarded to 5th place, Division winners will receive a prize. Stalls are available to rent and we recommend pre-registering to secure a stall. For more info and to register click the Website Link above. Click to view our Facebook Event page. Click Event Website Link above for more details! Click the Event Website link above for more information. English and Western performance classes will take place in the Main Arena. We offer Halter and Showmanship classes where horses and handlers are judged as they work in hand. Following the In Hand classes, we start with Walk Only Classes for our Novice Riders and Green Horses, followed by the Walk Trot classes and the Walk Trot Canter classes. Click the Event Link above for more details. 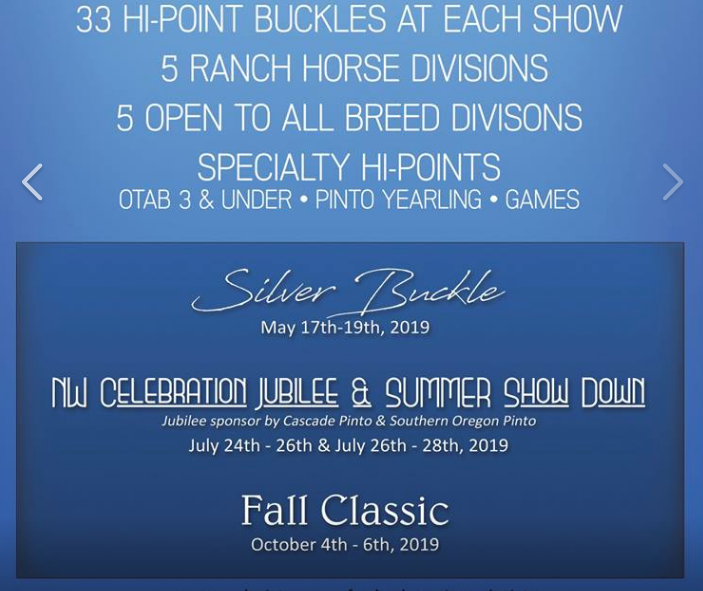 Categories: NW Horse Show "Open"